The #NoBallChallenge is the next viral trend you'll embarrass your kids with. When a group of kids got their basketball confiscated, they didn't let it ruin their game, they just created a new one to parlay into viral glory. Mashable reports that students at Nocross (more like Noball?) 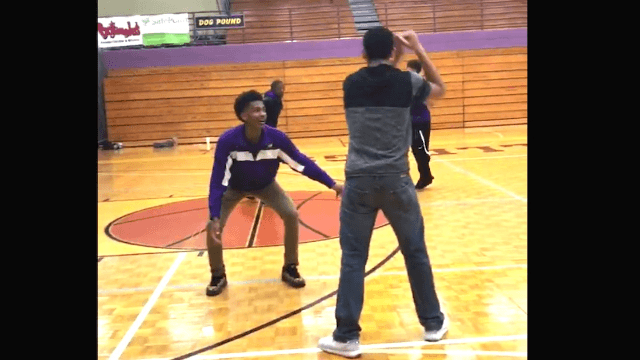 High School created the #NoBallChallenge, playing a full-on ball game minus the ball. Kids at other schools started playing too, like these kids whose school team is the Bulldogs. And these kids, who play for the Warriors. And these Blue Devils, who took it to the next level with music. While the #NoBallChallenge has yet to meet #MannequinChallenge levels of fame, let's sit back at watch it grow until NBA teams get in on it.